Overall, a nice stab at the touchpad. Apple's is, honestly, better, but the Logitech one gives access to touch gestures for desktop users, and those without touchscreens. We'll leave it to you to decide how important you think that is. Windows 8 brought with it a quite specific problem - be it real or imagined - namely, that it was created for touch interaction. So the Logitech T650 was designed to bring touch to the millions upon millions of computers in the world that have no touch abilities. Costing £69, its a bit on the expensive side, but for the money you do get something that looks as if care has been lavished on its design and, let's be honest, it's cheaper than a touchscreen monitor or new laptop. 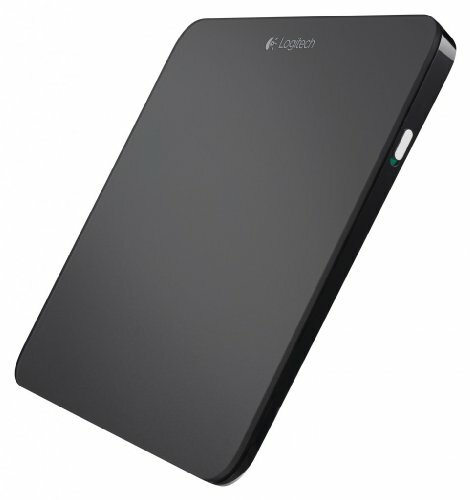 It's pointless to pretend that the Logitech isn't a little inspired by the Apple magic-whatever-it's-called. But then, it would be hard to design a touch interface and not have it look similar. There are some interesting differences though. The Logitech, for example, has a built-in rechargeable battery that the company says will last about a month of normal use. That's fine, because it takes only an hour or so to charge from flat. You can also use it while it's charging, as long as it isn't totally flat. The only other things, beside the surface itself, that adorn the outside of the device are the USB charging port, and the on/off switch. When you're using the touchpad, you'll notice it "clicks" when you press it. This is kind of unnecessary, because we think people are used to laptop pads now, on which you can select things by tapping the pad. It's interesting to note that this clicking comes from the two front feet, an interesting system, we have to admit! Other than that, we really like the T650's design. It fits in brilliantly with most desktop PCs, and if you want something that aims to bring the touch features of Windows 8 alive, then it's perhaps the best choice. Here's where Logitech has the advantage of Microsoft. Every single piece of Microsoft hardware we've ever bought or reviewed has come with a different USB dongle. These little devices are the tech that allow your wireless device to talk to your PC. Sadly, Microsoft seems to send a different one with every device, and they don't play well together. With Logitech, the new unifying dongle allows you to pair up to six devices with one USB transceiver. Brilliant, that's loads of USB ports saved and on an Ultrabook, that can be a massive deal. Of course, one alternative to these bespoke USB dongles is to use Bluetooth. On PCs though, our feeling is that Bluetooth is rubbish. It might work on Macs, but we've had so many annoyances with Windows 8 and Bluetooth that we'd far rather use a single Logitech dongle to handle everything. To get your devices working, it's a matter of switching them off, loading the Logitech Unifying Software and then following the instructions. The pairing process is dead easy, simpler by far than Bluetooth with it's silly pairing keys and voodoo button presses. The device you buy also comes pre-paired with its dongle, so you only need to do this if you're adding something else at a later date. As you might imagine, gestures really are the selling point of the T650. Think of it as a reflection of the screen, and you'll understand what to do, as long as you know what the Windows 8 gestures are. The ones we think are most useful are, the old school two finger scroll. This feels natural now, as we're all so used to tablets, but it's a good idea. Flicking three fingers to the left will send you back and pinching will zoom you in. To be honest, we disabled the pinch-to-zoom as it just kept getting in the way of everything else. Other gestures are more specific to Windows 8. So dragging a finger in from the right brings up the "charms" menu. Dragging four fingers downward minimises windows, while a single digit swipe in from the left will allow you to task switch between recently opened apps. The problem we had most often was the right context-sensitive click in Windows. It relies on your hitting the touchpad in the bottom right-hand corner and, while we can do it sometimes, there are plenty of occasions when all that happens is a dull clicking sound, and the on-screen pointer doing something annoying or unpredictable. Overall, the touchpad is a decent way to navigate Windows 8. It's as good as using a touch screen for the most part and for most things, really very smooth. The surface is silky smooth, and that helps a lot with gestures and the like. But as with wireless mice, there are problems too. Accuracy just isn't as good as our trusty old wired mouse. It might sound daft, but we don't make mistakes with our old, dumb, cabled rodent, but constantly with modern, touch-enabled devices, we'll find them not doing what we want them to. Often, with the touchpad, we'd find ourselves doing things we didn't mean to. For example, switching tasks - with the left to right swipe - and that did become bothersome quite quickly. We're sure that, with time, we would learn how best to use the Touchpad, but coming in as amateurs, it's a learning curve that will see some people sigh with exasperation, put the T650 into its box and return it to the shop. For many though, it's likely to be the breath of fresh air Windows needed. Overall there's a lot to like here, although we think the OS X gestures and trackpad is a more rounded product. It could be that Windows 8 causes some issues, or it could be that the T650 is easily confused, but we did sometimes think the thing was less polished than we would hope. Windows 8 works really well without the touch stuff, but if you feel like you're missing out, the T650 is just about the best solution we've seen. Better than all the touch mice that have started to appear on the market and very nearly as good as a touchscreen. The price is arguably a bit steep. We aren't that impressed by the scroll speed either and the clicking can be a little laboured too - especially right click, which can take an age to find. We prefer an old, trust, wired laser mouse, and we barely notice the lack of touch. But happily, this world is full of different people, and just because we're living in the past, doesn't mean you are too. In which case, if you're looking for a laptop-like touchpad experience, this is the nicest we've used .